Some of you will know that I don’t just write about food. As an academic writer (in my earlier profession) I was widely published. After my redundancy I began working on prose, poetry and short stories. Now I’m writing a novel (which may never be finished let alone published). I also love literature and reading and have attended many book readings, signings and the like, mostly in small, dusty cramped book shops, impersonal university lecture rooms or a muddy literature tent at a festival. 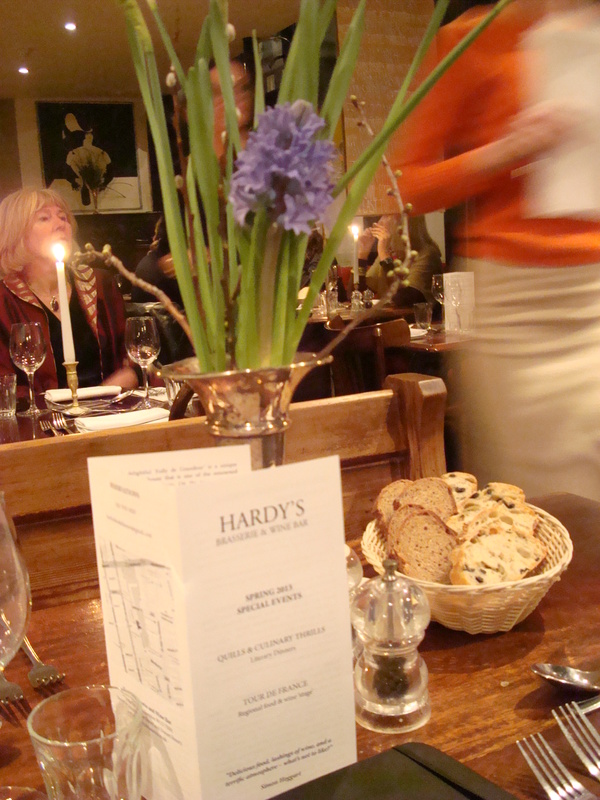 This was my first grown-up literary dinner which was held at Hardy’s Brasserie and Wine Bar. The prospect of a more glamorous experience with a three course dinner cooked by Hardy’s new head chef, Raymond Blanc protegé Sam Hughes, filled me with excitement and anticipation. I wasn’t sure what to expect. The meal entitled ‘food for love’ was advertised as a ‘traditional’ Welsh dinner inspired by writer Deborah Moggachs new book Heartbreak Hotel. Set in the rolling hills of Powys the food was matched perfectly and the ingredients and menu were right up my street, but the literary experience? Intrigued, I was keen to find out. Deborah’s book focuses on a bed and breakfast in Powys taken on by ex-Londoner Russel ‘Buffy’ Buffery. To make a bit of money he runs ‘Courses for Divorces’ where spurned ex’s learn the skills their partner brought to the relationship. This is not my usual reading matter. I am a fan of the ‘gritty’ novel and when I tell you that my favourite writer is Solzhenitsyn, you will realise how far out of my usual reading sphere I had travelled. My choice of reading is the polar opposite of stories about the divorced middle classes bonking in a Welsh B&B, if get my drift. Needless to say I felt a little out-of-place among the Marylebone women and at one point imagined I’d stepped into an upper class WI meeting, where everyone is getting tight on wine and having a jolly wheeze! Sadie and Kate, my dinner companions, were by far the youngest people in attendance. Kate is an art writer, photographer and avid reader, while Sadie is London poet and barkeeper whose idea of a romantic night out is trying out a series of outrageous chat up lines on unsuspecting men (hi, i’m fertile, whats your name?….reserved for men of a certain age or, hi, I really need a seat…can I use your face….should really be saved for the council estates of Dartford and not used in a classy Marylebone bar). Needless to say the pair of them got their entertainment by spending most of the evening eyeing up the barman and the waiter in turn, as we realised Deborah’s books attract a totally different demographic to us! 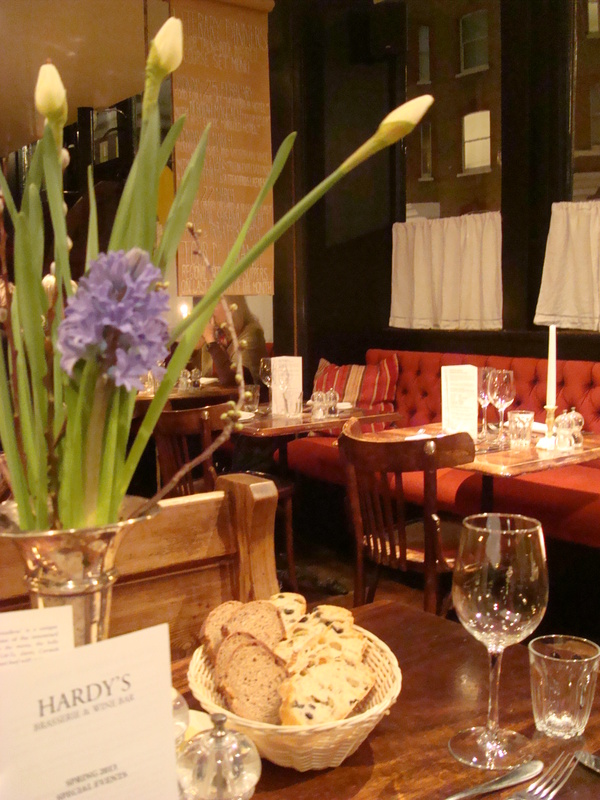 Hardy’s is a stylish, cosy bistro on Dorset Street, close to Marylebone station and Baker Street tube. It’s not my usual haunt (even when I lived in London or even when I visit) but it is for Sadie who works just around the corner. The evening we attended was busy. Very busy. 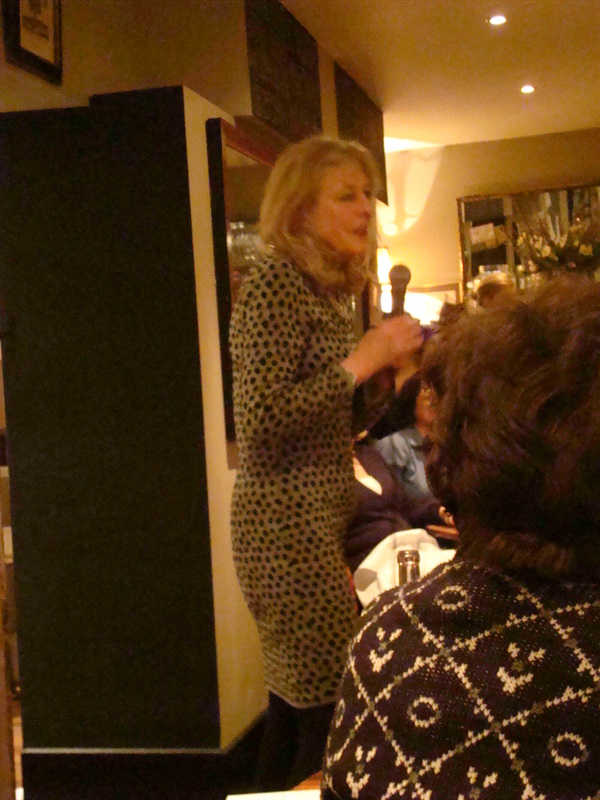 Clearly the literary dinner is proving popular and we were almost literally shoe-horned into narrow seats near the bar. 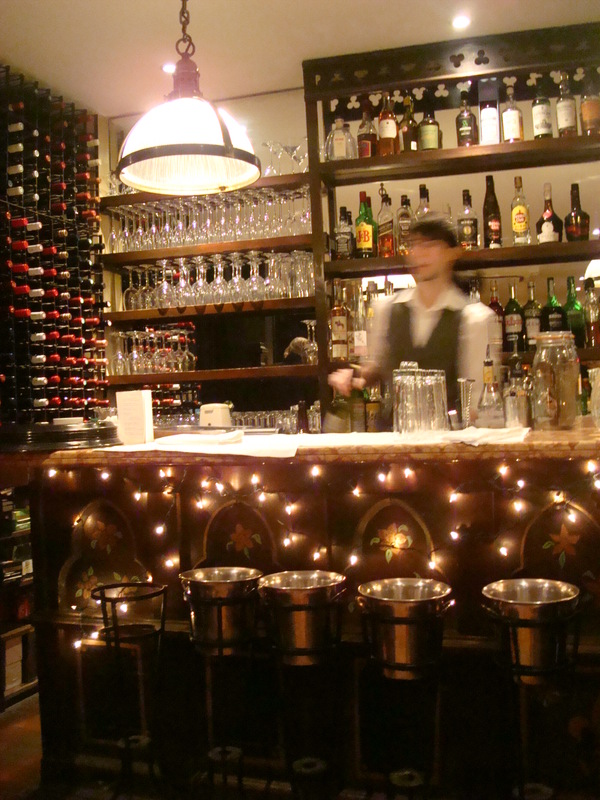 Hardy’s staff were friendly and welcoming if a little flustered at times. I didn’t get much of an opportunity to chat to the hosts as they were understandably busy and this seems to be something of a new venture for them. They are clearly still getting used to dealing with the massive influx of dinner guests arriving at once. As I sat at my table the waiter swiftly offered an aperitif; wine or Brecon gin and tonic. I opted for gin as I know and love Brecon. There wasn’t a huge amount of space to move chairs in and out; not a problem for me as the other dinner guests were quite understanding, but others might find this less relaxing. Bread arrived as did the offer of tasty canapes with laverbread and pancetta which we nibbled as we while we studied the menu and made our decision about what to eat. Tempted, Kate devoured several claiming she’d never tried laverbread, and choosing to ignore the rest of the topping “Do not tell anyone I ate pancetta”…. (now lapsed vegetarian). We all settled on something different so we could have a taste of each others. 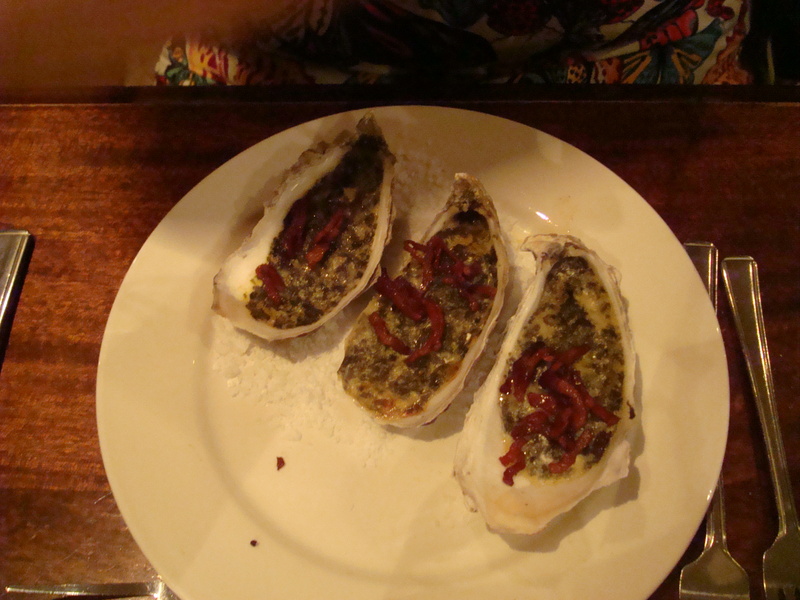 Kate chose baked oysters with laverbread and crispy pancetta (yep, well and truly lapsed veggie by this point). The sauce was flavoursome, although even confirmed salt-fiend Kate said it was a little too salty with the pancetta. 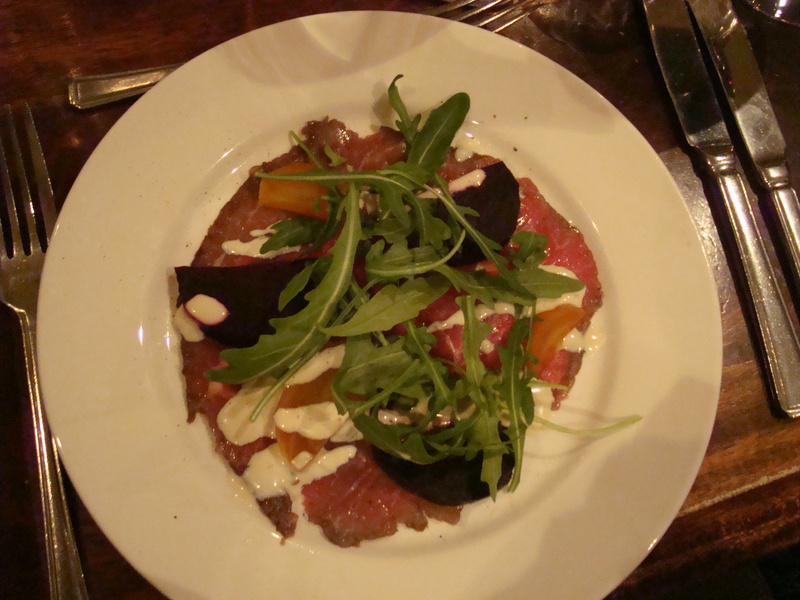 Sadie opted for Welsh black beef carpaccio, anchovy, garlic and rosemary dressing which was lovely. Small tender beetroot chunks worked well and we all enthused over the dressing which was the best bit. 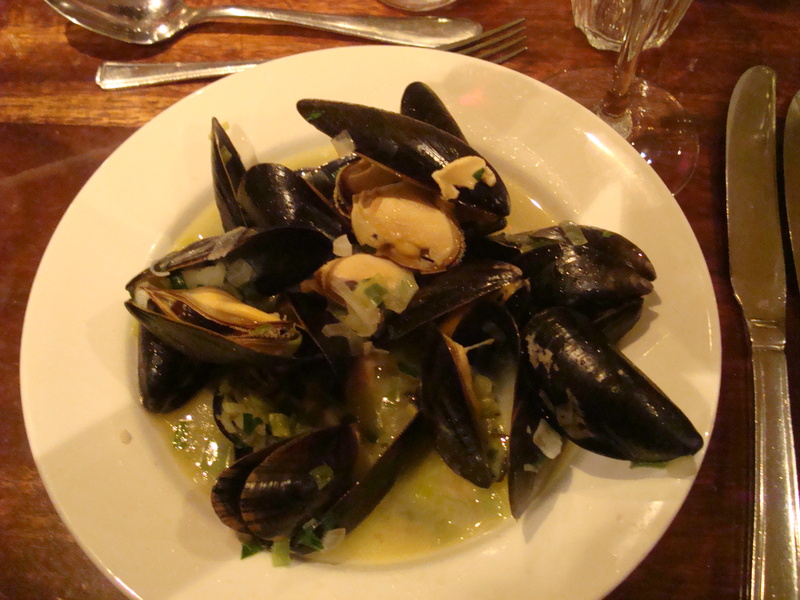 I chose steamed mussels with leeks and wild garlic. The mussels were delicious; plump, salty and perfectly cooked while the leek base was well seasoned and tasty, but only a mild hint of the wild garlic came through. 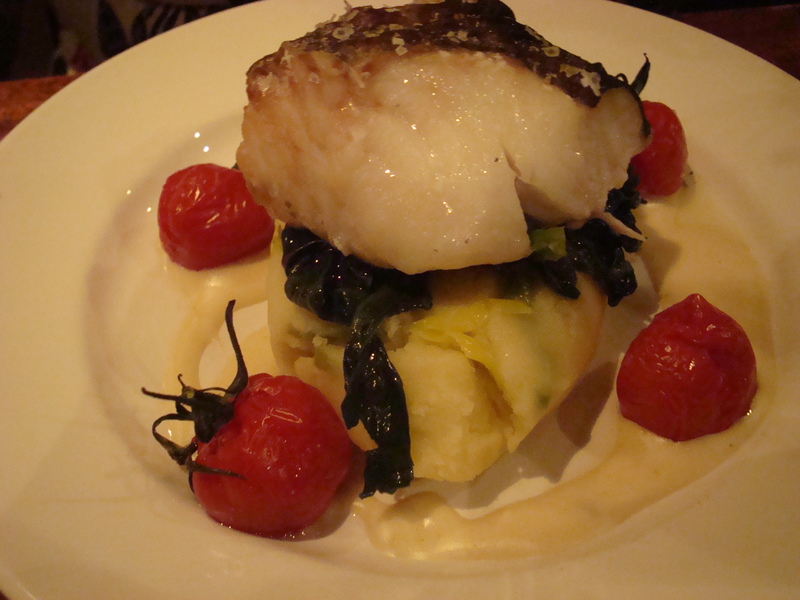 For main Kate chose Cod ‘Cymru’ with cheese sauce, spinach, slow roast cherry tomatoes. The cod was cooked perfectly, the sauce and mash, which was rich and creamy, were delicious but the dish itself was a little uninspiring overall. 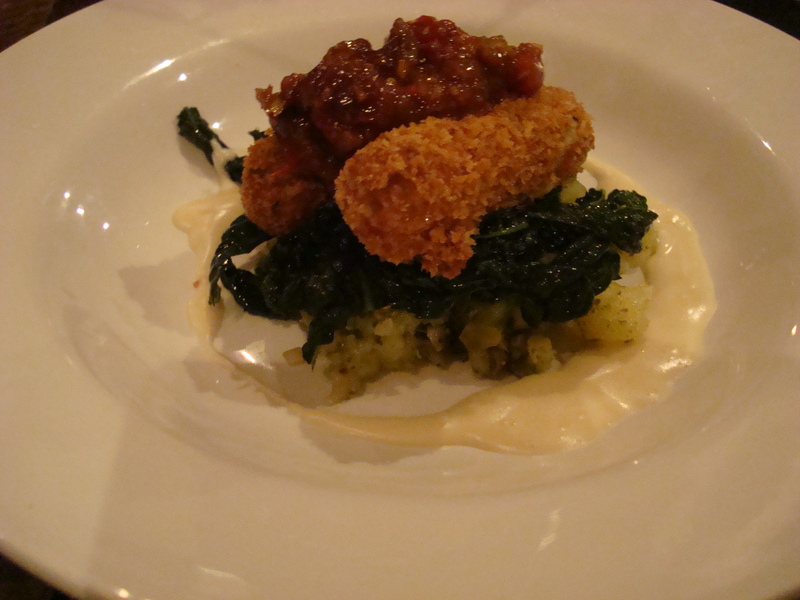 This again was a theme with Sadie’s Glamorgan sausages, mash potato and spiced tomato relish. The relish was well-flavoured, but the mash was more like crushed potato and not half as rich or creamy as Kate’s and the Glamorgan sausages were just lacking in flavour a little. A good strong Welsh cheddar would have perked these up and not a light Caerphilly, which just doesn’t have the strength. I know it’s traditional, but hey! 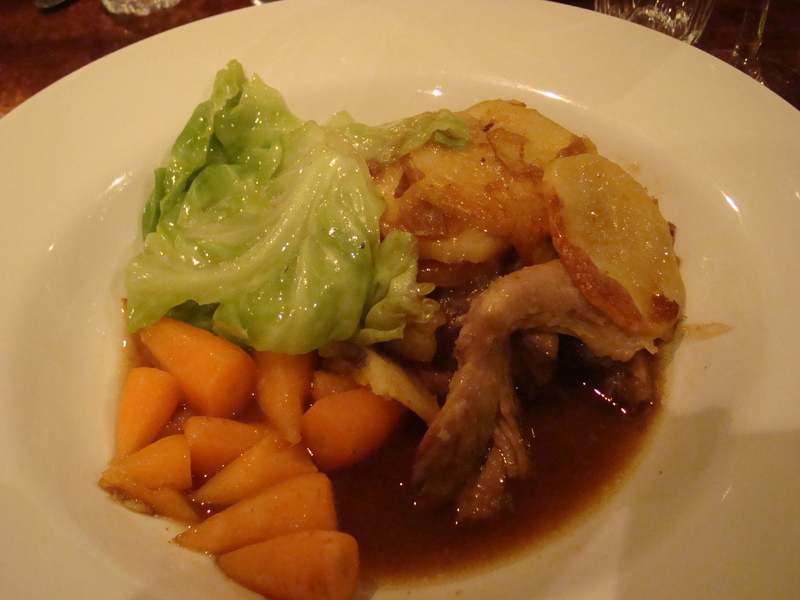 Finally, I chose the 12 hour slow roast lamb in lavender with braised onions and potatoes, chanteney carrots. The lamb was delicate, tender and melted in the mouth. It had just the slightest hint of sweetness (which I presume was from the lavender) but the lavender itself was barely detectable among the deep flavours of the jus. The carrots and potatoes were nice but perhaps a leeky mash might have been better to soak up the sauce. We all felt full at the end, but not too full for dessert. Again we chose three separate dishes which turned into musical bowls! Kate chose a ‘Snowdon’ steamed marmalade pudding, I opted for the cheese board with Perl Wen and Golden Cenarth from the Caws Cenarth cheese makers of whom I am a regular customer and Sadie went for a Welsh borders lemon meringue tart. The cheese plate was sadly disappointing. There were plenty of crackers and a beautiful home-made fig and pear relish, but there were only two small pieces, which barely gave a taste of what Wales has to offer. Either a greater choice or at least slightly larger portions might have been nice. Kate looked at my plate declaring that she would have preferred cheese, not having a sweet tooth, so I offered to swap. 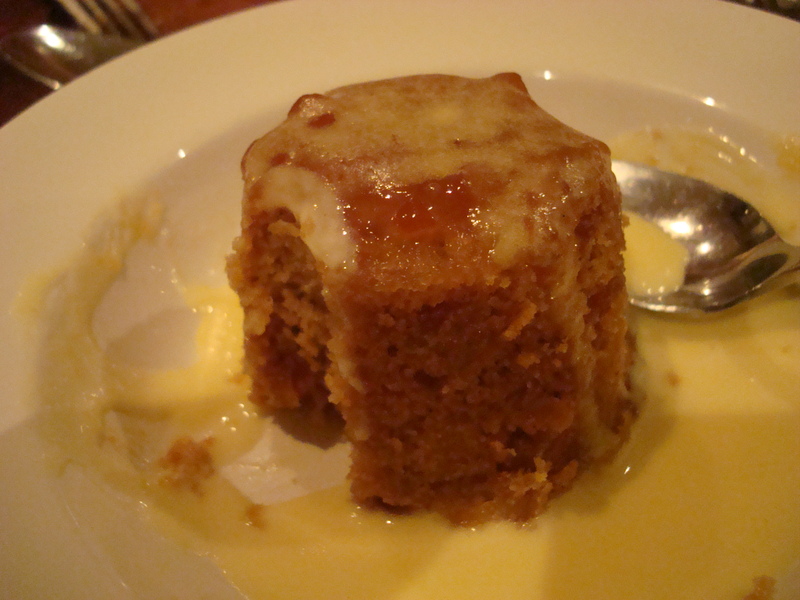 Her steamed marmalade pudding was more to my taste as I definitely do have a sweet tooth. It was delicious, but I’m greedy and would have liked a bit more custard. I only had one spoonful when Sadie declared that she wasn’t that keen on lemon and the tart was very lemony. She looked at me beseechingly, so once again this time with a small sigh of regret, I handed over my plate. 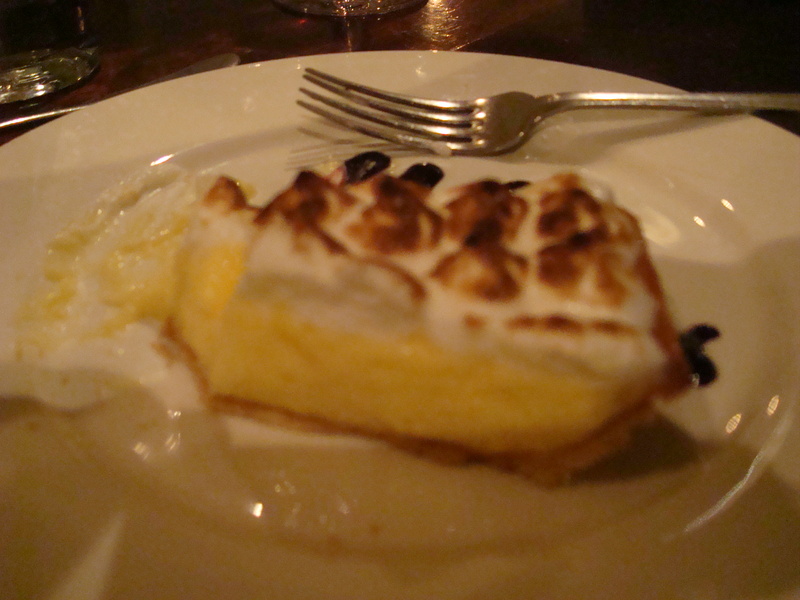 I loved the sharp lemony tart but was slightly disappointed to find that the top of the meringue was finished with a blow torch and not oven baked so it lacked the crispy topping and marshmallow centre that I love. My thoughts overall? I love the concept of the literary dinner. It’s a more refined, grown up way to enjoy literature and all the flavours of a books setting….its an all glamour and no mud affair and a very sociable one too. The cosy environment, a shared interest in the writer, book and food created a more relaxed environment to dine in, but I was rather disappointed that Deborah didn’t read an excerpt. Even if her books are not strictly to my taste its nice to listen to a writer read from their work in their own ‘voice’ as it gives the reader an insight into the creator of the story. Instead we just got an introduction to the background and a general chat about the book. 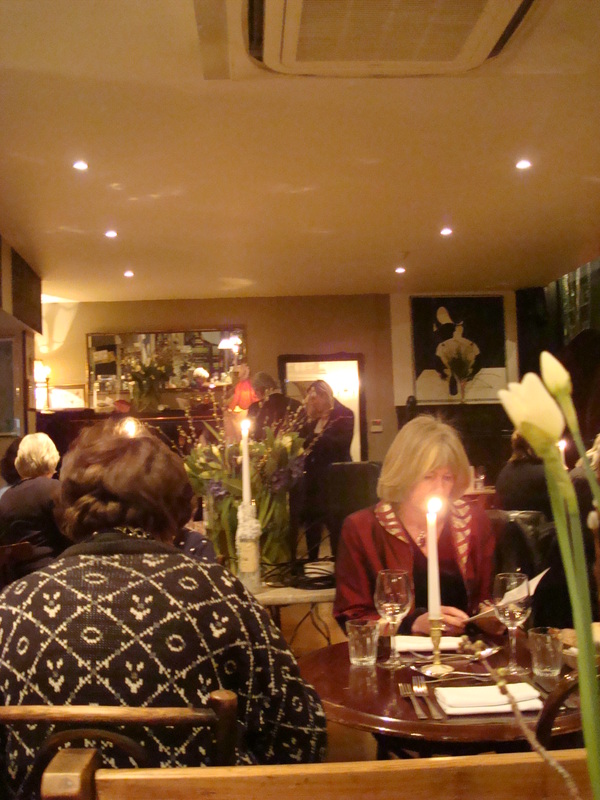 Beyond the Cherry Orchard….A Russian Feast on Friday 22nd March and Viva Tequila! with Cleo Rocos (which sounds right up my street) on Thursday 18th April…Cevice, squid and chorizo, pulled pork…plus tequila, what’s not to like!! The food was undoubtedly delicious and well worth the £40 a head price tag. We agreed that Sam has a particular talent for sauces and dressings, all of which hit the spot pleasingly. The ‘Welsh’ menu could have been more inventive and there were elements that didn’t work as well, but having said this its nice to see a chef experimenting with different food/menu’s etc. That is the pleasure of running a supper club, the opportunity to experiment and these dinners provide exactly that for Sam. He was also very happy to talk to us after the meal, but I think the girls may have scared him with their drunken insistence that he come to the pub round the corner for cocktails. He looked a little scared……so sorry for kidnapping you Sam, we are quite normal really. 53 Dorset Street, London, W1U 7NU. Sadie Jane Medhurst, Kate Withstandley and I were guests of Hardy’s Brasserie and I extend my thanks to Rosie Apponyi and Dominique de Bastarecchea for their hospitality.